Summer pregnancies can be hard, plain and simple. Mix the heat and humidity with higher-than-normal body temperatures due to an increase in blood flow, and, well, it's enough to make expectant parents want to stay inside with the chilly AC all season long. But fall is just around the corner, and with that, cooler and more comfortable weather conditions—and in turn, a more comfortable, cooler pregnancy. 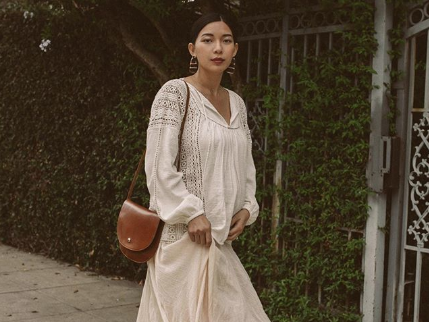 This also means that it's time to update your wardrobe with more climate-appropriate pieces, and one staple that we think should be in every parent-to-be's autumnal rotation is a fall maternity dress. Ahead we cherry-picked 26 of our favorite styles that are guaranteed to make you the most fashionable person in the room. The styling options with the below picks are truly endless as well because versatility is key when it comes to maternity pieces. Pair a chic wrap dress with cute booties or for a more comfortable take, slip into casual sneakers. And if you're feeling a sportier approach, we found the cutest sweatshirt dress that you may never want to take off. Now, read on to shop the best fall maternity dresses on the market. Available in size S to XXL. Available in sizes P to M.
Next up, check out our maternity style guide to follow for the next few months.